1-jet, 2-jet or 3-jet, mounted on the wall or installed flush with the ceiling: hansgrohe overhead showers all guarantee customised water indulgence. Here you will also find the angle-adjustable overhead shower Raindance Rainfall Stream, PuraVida overhead showers or water-saving models such as Croma and Crometta. The allure of “showering large” and aesthetic indulgence. With a jet width of up to 580 mm, Rainmaker Select is one of the largest overhead showers with a glass spray disc on the market. With its white background, it integrates smoothly into the ceiling and, in combination with the slender chrome frame, looks elegant and light. Height-adjustable wall mounting is feasible: easily implemented based on the iBox universal; or another basic set in the event of ceiling mounting. All-round showering fun at the touch of a button. This is what the Raindance Select E 300 offers with its jets Rain (invigorating), RainAir (soothing) and gush spray RainStream (enthralling). Also the Croma Select 180 Vario – with its balanced Rain jet and intensive IntenseRain jet. The Select button, which can be reached from below, makes switching between jet types really easy. Harmonious solutions for different shower scenarios. The quadratic design of the Raindance E 300 attracts new customers in a variety of style worlds, and can be perfectly combined with modern hansgrohe mixers. 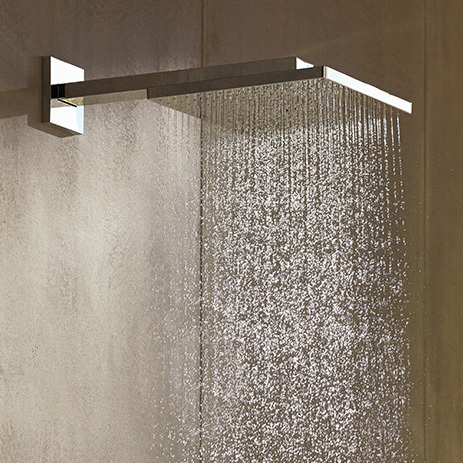 The overhead shower, with the ergonomic layout of its individual jets, delivers optimum performance. 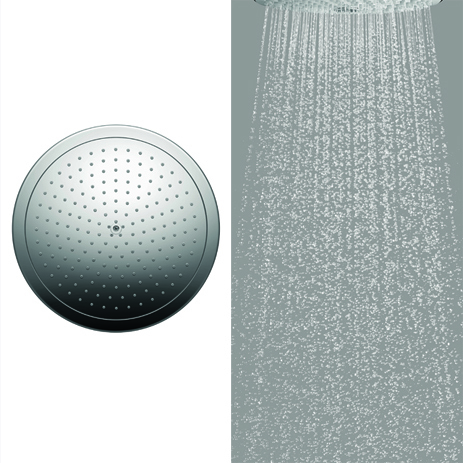 The lavishly indulgent XXL shower is available for wall mounting (300x300 mm) or flush with the ceiling (400x400 mm). This built-in variant is also available for the Raindance Rainmaker, with or without integrated lighting. The ultimate in convenience – value for money in the project business. Models such as Croma and Croma Select are extremely user-friendly and offer a lavish showering experience at an affordable price. Ø 180 mm spray discs come in two shapes (round/square) and in two surface finishes (fully chrome-plated or white/chrome). 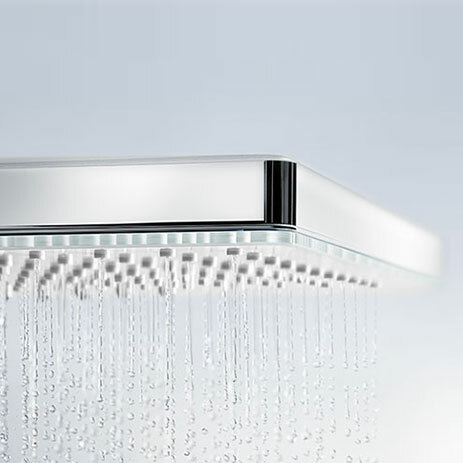 The round Croma (Ø 280 mm) pampers the user with full-bodied RainAir shower rain. Its large spray disc is made of fully chrome-plated, high-quality metal. True design greats for the smaller budget. Inexpensive new products such as the Crometta 160 are premium products in the entry-level segment. This overhead shower with a Ø 160 mm spray disc comes in a modern design with two surface finish variants (chrome or white/chrome). Feel-good factor included, thanks to the pleasant shower jet. 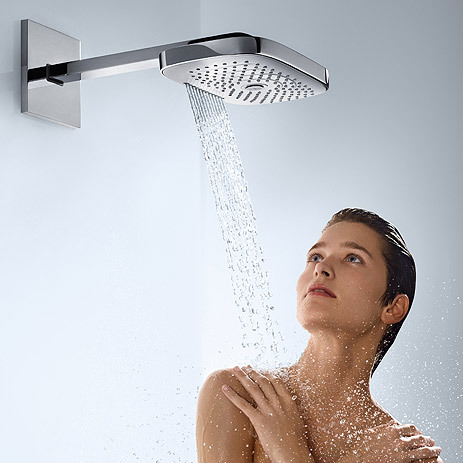 hansgrohe overhead showers are quite exceptional thanks to their variety of shapes, multi-functionality, and the fact that they are easy to operate and convenient to clean. Innovative features such as AirPower and XXL Performance. Lots of models are available in EcoSmart versions with a water consumption of just 9 l/min. The fact that they are easy to clean in just a few simple steps: for example, the easy-to-remove spray discs on the Raindance, Croma and Croma Select, which are easy to clean and can even be put in the dishwasher. They can also be cleaned with the sophisticated anti-limescale solution QuickClean. 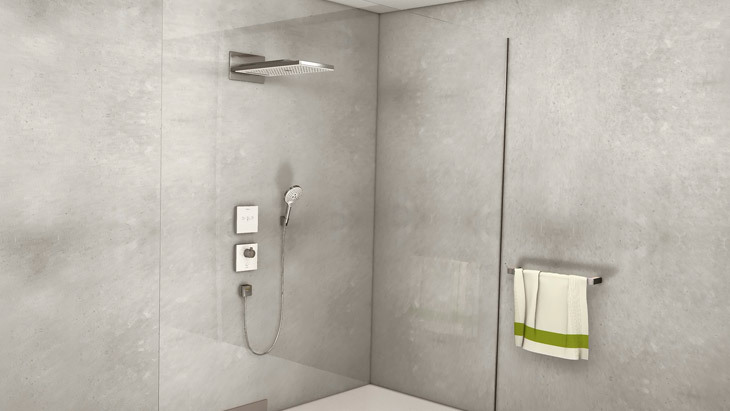 Or with QuickConnect, which involves removing and cleaning the Rainmaker Select overhead shower without the use of tools – ideal for use in hotels. Tips & tricks for installation & maintenance on YouTube!